Our journey to Middle Earth began early Friday morning by heading East across the US to Miami where we transferred to another plane heading South. We arrived to Quito in the evening, where the aromas were very similar to those of my homeland Buenos Aires, Argentina. The host and guide of this magical mystery tour is, Eduardo Villacis, who was awaiting our arrival at the airport with his wife Maria. Eduardo invited Greg, referred on this blog as Maestro Gregorio, to give a week-long workshop at the University of San Francisco in Quito. The week-long workshop is Greg’s premiere of his class titled Artist as Brand. Artist as Brand is a concept Greg has been developing for years facilitated by his own transformation as an artist and yearly visits to the Comic Convention (Comic Con) in San Diego, California. The workshop begins Monday evening with Greg showcasing his evolution as a creative spirit. The journey begins as an eldest brother of a family of six, much like the Brady Bunch, to where he has arrived now as an award winning illustrator and film production artist. Quito, the capital city of Ecuador straddles the equator, placing it right at the middle of this planet earth we inhabit. The day and evening is equal in length and the weather remains constant year round. 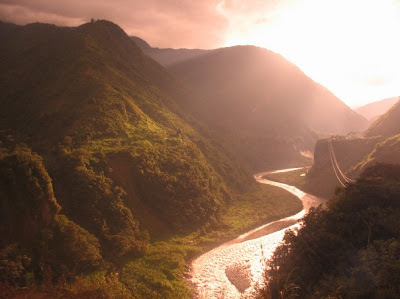 A small country, rich in history, along the Pacific coast which shares a border with Colombia and Peru. Although the primary residents are the exquisite faced Incas and indigenous tribes, a variety of people from all parts of the world now make this rich, fertile land their home. The light of the Sun gently stirred me awake this morning as I arose to a glorious view of the verdant green, tropical mountains. I gasped at the site, for when we arrived at the hotel from the airport it was dark out and I had no idea of the spectacular scene that patiently awaited my gaze. 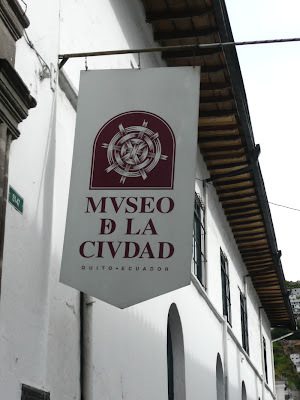 The central square of Quito is at 9,350 feet above sea level. The city is located at zero latitude. The word Ecuador translates to equator in Spanish. The name for the city comes from the pre-Columbian tribe, Quitu. Our first day was spent organizing ourselves in the morning with a splendid tour of downtown in the afternoon with our extra ordinary guide, Eduardo. I must say that experiencing a country with someone like our host, who is very well educated in the history of Ecuador, is quite a treat. Here are a few visuals of the afternoon excursion with some commentary. 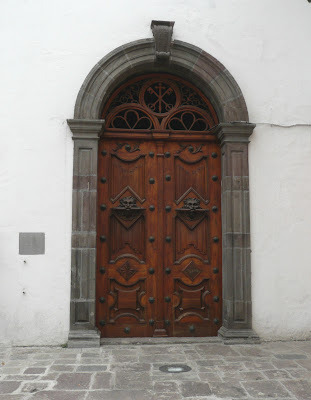 In downtown Quito there is a church at just about every corner, each with beautiful architecture and masterful hand worked wood doors and statues in the interior. This photo is a shot of the exterior of The Church of the Society of Jesus, aka The Company referring to the Jesuits. There were so many splendid aspects of this church both on exterior facade and within the interior. Upon first seeing the baroque church I immediately thought of Antoni Gaudi structures in Barcelona. 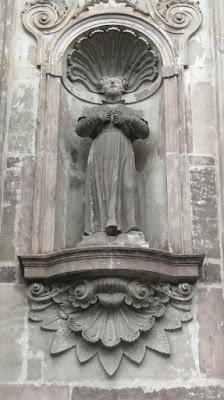 I was particularly taken by how the use of the shell and leaf images adorning the Saint. The interior features glorious golf leaf covered engraved motifs, finely painted portraits of and intricate Moorish designs. This church is really glorious. it's breath taking to think of all the beauty that artists have created over time because of the Catholic church. The energetic blueprint of all the craftsman that imbued this church with their creative spirit is apparent to the naked eye as well as those who can "feel" energy. Eduardo explained how there was a Guild for each of the hand crafts and each one is looked over by a specific saint. 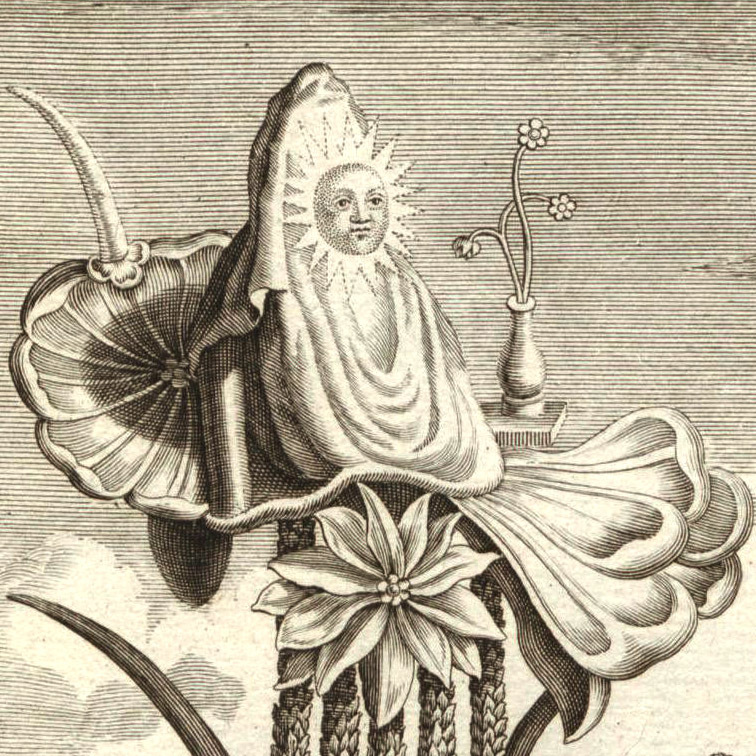 According to Catholic.org, Nicholas of Myra is the Patron Saint of Perfume. 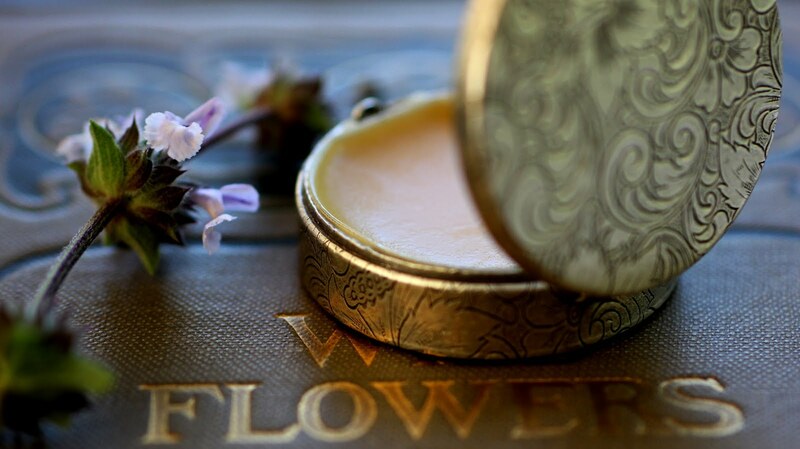 Since botanical perfume is tied into sustainability than Francis of Assisi, as the Patron Saint of ecology and merchants, is probably a better fit. Eduardo and his wife Maria both worked on the restoration of a historic Hospital in the city center that is connected to a church via an arch. The hospital has been renovated into a Museum. We had the pleasure of a very in depth tour of the ancient structure. 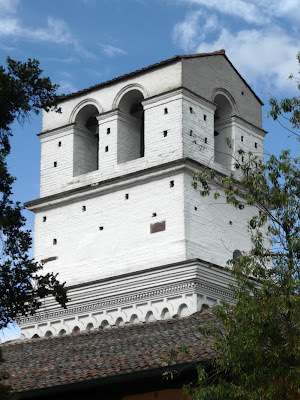 The Hospital was constructed in Mediterranean style with two interior courtyards. 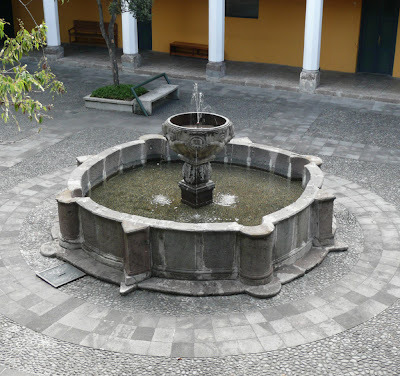 The first featured a fountain. 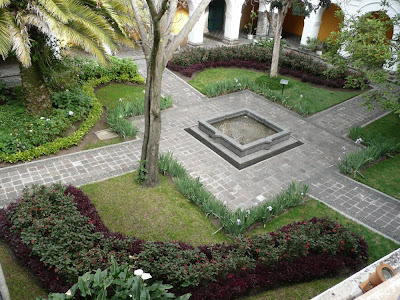 The second courtyard featured a a variety of plants. Hospital tower view from one of the Courtyards. 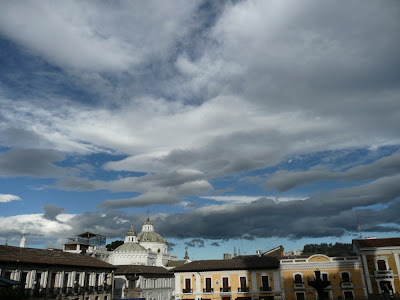 glorious display of Quito’s sheltering sky above some of the colonial architecture. More pictures and adventures are in store. for Monday evenings opening of the workshop. 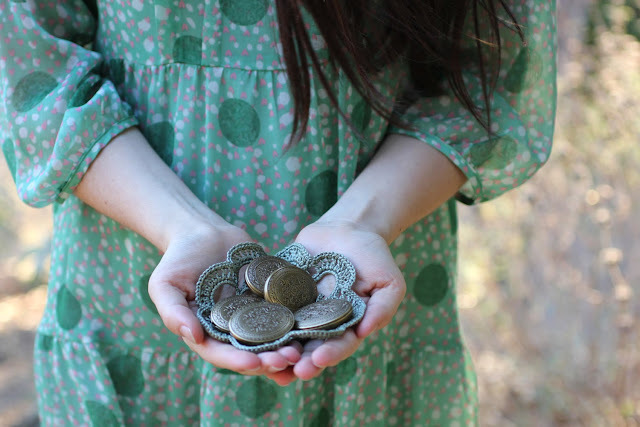 Images: The opening image was found via Google images thanks to Eve. The image of the Church of San Francisco was taken by Eve and all the other photos were taken by me. Thank you, thank you, thank you! Love the sights and the narration! Enjoy!